UNIVERSITY OF SEVILLE—A new study of Bajondillo Cave (Málaga) by a team of researchers based in Spain, Japan and the UK, coordinated from the Universidad de Sevilla, reveals that modern humans replaced Neanderthals at this site approximately 44,000 years ago. The research, to be published in Nature Ecology and Evolution, shows that the replacement of Neanderthals by modern humans in southern Iberia began early, rather than late, in comparison to the rest of Western Europe. This new dating study of Bajondillo Cave instead calibrates the replacement of Mousterian industries by Aurignacian ones there to between ~45-43,000 years ago, raising questions about the late survival of Neanderthals in southern Iberia. 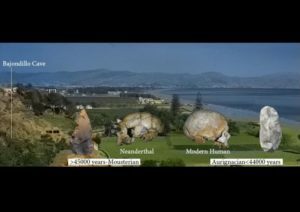 Further research is necessary to determine whether the new Bajondillo dating indicates an earlier replacement of Neanderthals across the whole of southern Iberia, or in fact, an altogether more complex scenario of co-existence over several millennia. This research also highlights coastal corridors as the favored routes for early AMH.